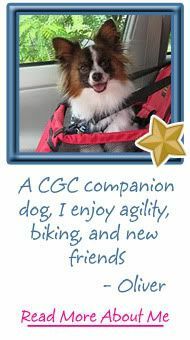 A friend of mine from agility is an avid rescuer, agility competitor, trainer and all-around dog enthusiast. For quite a while I listed her rescues in my sidebar. During that time an Aussie turned up that was quickly adopted after appearing in my sidebar. 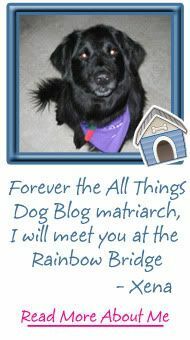 I have no idea if my blog was responsible, but Chris Engel is now Kota's owner, and Kota is a star in the disc dog world. 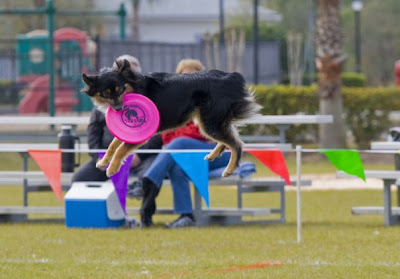 Today's challenge, or Weekly Wag, is to give your dog a chance at tackling a flying disc. I'll share a few tips that we tried with Tanner. He's no Kota, but he can catch short throws and enjoys the chase and the return. 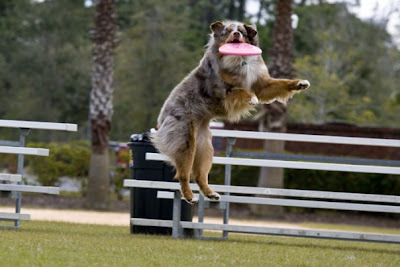 He just doesn't have the "ups" required to be a Michael Jordan in the disc dog world. That's okay! This Saturday weekly is all about bonding, not spectacular performance. 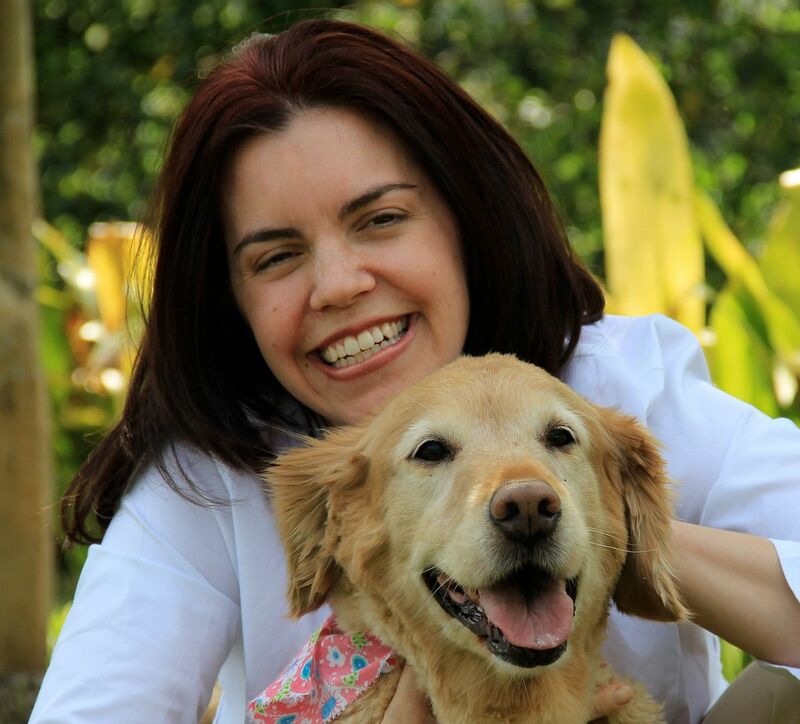 Start by knowing your dogs motivation (food, affection, a special toy) and having a solid recall. When Fido is watching you from a few feet away, gently toss a disc such that it will not hit him if he is completely surprised by it. Reward him for any effort to move toward it. Gradually increase your distance as he begins to learn to snag the disc in the air, making sure he gets plenty of attention for every effort. Keep your practice sessions short so Fido does not burn out. Fifteen minutes per session of trying to catch a plastic plate may be all that is required. Be sure to enjoy some one-on-one time afterwards. Rub his belly. Tell him what a good boy he is. Make this a special time for the two of you that is a regular habit and he will begin to connect the appearance of the disc with his time alone with you. That's when real progress will appear. Part IV: Frisbee Training Begins.. Need a disc and a cap to keep the sun out of your eyes? 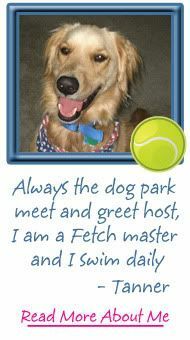 I'm giving away a Dog Park Kit in my sidebar, so drop by and check it out. You may be the lucky winner. If you enjoy this activity, be sure to leave a comment including any tips you learn along the way. Thanks for visiting. 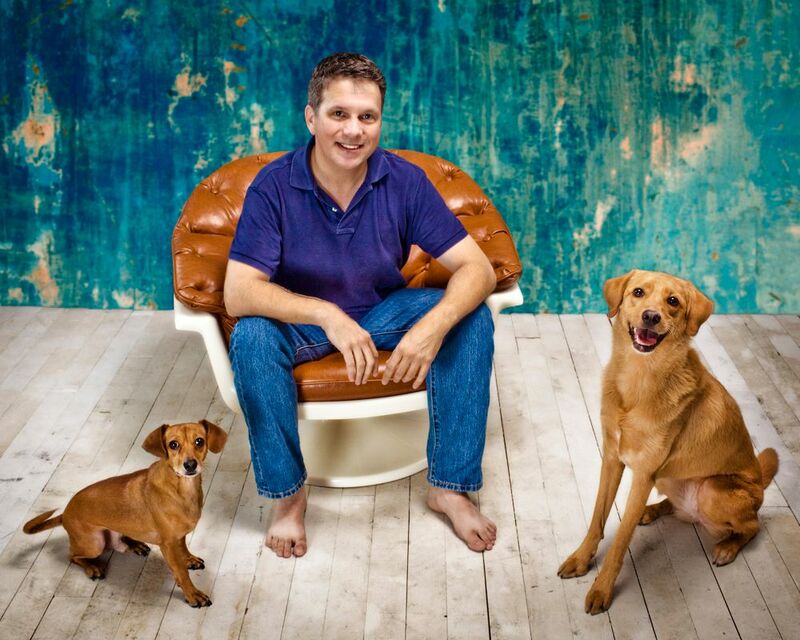 I hope to see you next week at the Weekly Wag, your bonding day with Bowser. 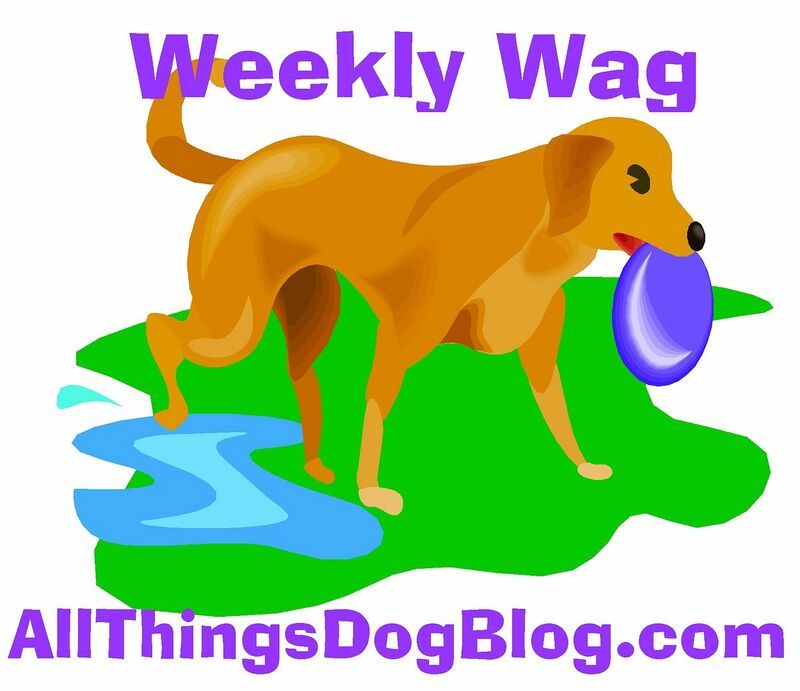 If you'd like to make these activities a regular part of your special dog time, sign up for our quarterly rewards program by clicking on the Weekly Wag button. 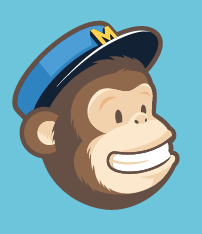 Be sure to leave a comment there and return regularly to tell us what you're enjoying the most. See you next week. I am sure you had a part in Kota getting home! Fun to learn more about dogs and discs! It is so fun to watch! I love watching Chris's videos. The dogs are so athletic. It amazes me how high they can jump. Yep, I have some moves...last year was practicing hoping to make the all star baseball team. This year, not so much. Been a little stiff and sore. Hope it doesn't mean I'm gettin' old! @Hawk, aka Brown Dog--what position did you play? Love the air time!! Sage can achieve it with a ball, which is her obsession. When Koly was a puppy he adored frisbee. We had gotten one of those tiny promotional frisbees with a hole in the center in the mail and he swiftly claimed it as his own. I'm always on the look out for them, as regular frisbees are so big they trip him, but I've never found one since. LOL, maybe this will be the year I break down and order them with Kol's Notes branding on them. The minium order can't possibly be more than a few hundred pieces, right?? Anyone want a tiny frisbee??? I'm glad it's not about perfect performance, because I'm not gonna show off.